We do a lot (seriously, A LOT) of custom wooden signs for weddings and one thing to keep in mind is that there are so many ways to design, decorate AND display your signs. Best of all, if you plan it out, these signs can find a place in your home after the big day. Because who wants to spend lots of money on a decoration they can only use one? Keep reading to see a list of some of our favorite wooden wedding signs and tips on designing, displaying and reusing those sweet keepsakes. Welcome signs are great. The layout of this pine wood sign is one of our favorites because it's elegant and simple. For the event, we displayed the large sign on a wooden art easel and attached soft pink spray roses using floral wire wrapped around the top of the easel. Best of all it's versatile. 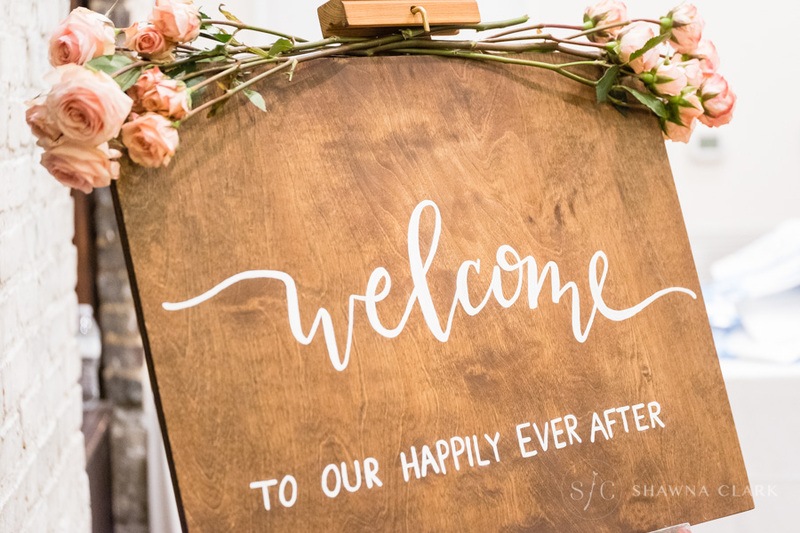 After the wedding, this sign can be hung in your entryway or over the mantel to welcome each person that enters your home to your happily ever after. Odds are you've chosen a signature drink (or two!) for your reception. Now you're scouring Pinterest to find a sign with that exact drink option with fingers crossed. Not to worry! We'll help you design the perfect drink sign (on wood or paper). We created this design for a citrus themed event and displayed it on a little gold stand and a super cute bar cart. These donut signs are super popular. In fact, last year we sold more of these than any other wooden sign design. And we can see why. If you're serving up sweets on a buffet or as your event favor, a wooden sign like this one will make the display even sweeter. After the wedding, just hang your donut sign on your kitchen wall. Your wedding may be over, but that doesn't make this sign any less true! We LOVED everything about this signature drink request. From the Sunshine & Whiskey song reference to the subtle illustration in the corner that rounded out the design. We made this sign for a rustic event and the creative powers in charge dreamed up this display using an old wooden ladder and bar props. Nailed it. THIS. We loved creating this wooden sign. As you can probably tell, it's a big one. Wood slices are perfect for you outdoor or rustic themed weddings. Just be sure to start with a well dried slice or you'll risk cracking it. This sign was displayed on a tall easel and decorated with moss. If your event has a garden area, wood slices look right at home among the greenery. Wooden signs personalized with your names or wedding date become an amazing keepsake that you can display anywhere in your home. Wooden menu signs are fantastic for buffets. Your guests can look over the menu options while they wait in line. Then have smaller signs by each of the dishes so guests can tell what's what. Doing it this way will not only help tie together the look of the buffet but also elevate it. Like the donut sign, this cake version is great for displaying next to the wedding cake. If your cake is layered with different flavors, you may want to have a cut cake table for your guests to choose their own piece. In that case, just display this sign along with smaller flavor signs to help guests navigate through their choices. After the event, you can hang this sign in your kitchen or as part of your wedding photo gallery next to a picture of you cutting your cake. Talk about a sweet ending! Here's a tip. If you're going to have a wooden sign created for your wedding that you won't want to display in your home after the big day, consider using chalkboards. Chalkboards and weddings just go together. We use chalk markers on our chalkboards because they are semi-perminant meaning they won't easily smudge like chalk. After the event, wash and dry the board then apply a fresh coat of chalkboard paint (available at any craft store). And you're done! There you have it! A line up of our most-popular, must-have wooden wedding signs. We LOVE hearing from you so while you're here let us know which is your favorite in the comments. Getting hitched? Use the contact form on our about page to inquire about our selection of wooden signs. Just reference your favorite(s) from this list so we can get you a quote.